The Second in the Series, ‘Walks from Castel Rigone’. Love walking? Love photography? Love sketching? This second walk is just perfect! It’s one of the shortest, easiest and prettiest whatever the season. It’s also a fun walks with kids because they will have fun watching butterflies, collecting fir cones, looking for figs and blackberries and there are usually lots of lizards skittering about in the undergrowth. Look out for this booklet at Information Centres, bars and hotels. This booklet is for families with young children traveling to the area around Lake Trasimeno and Perugia. It is available in Information Centres, Hotels, Bars and Restaurants around the lake. Free. 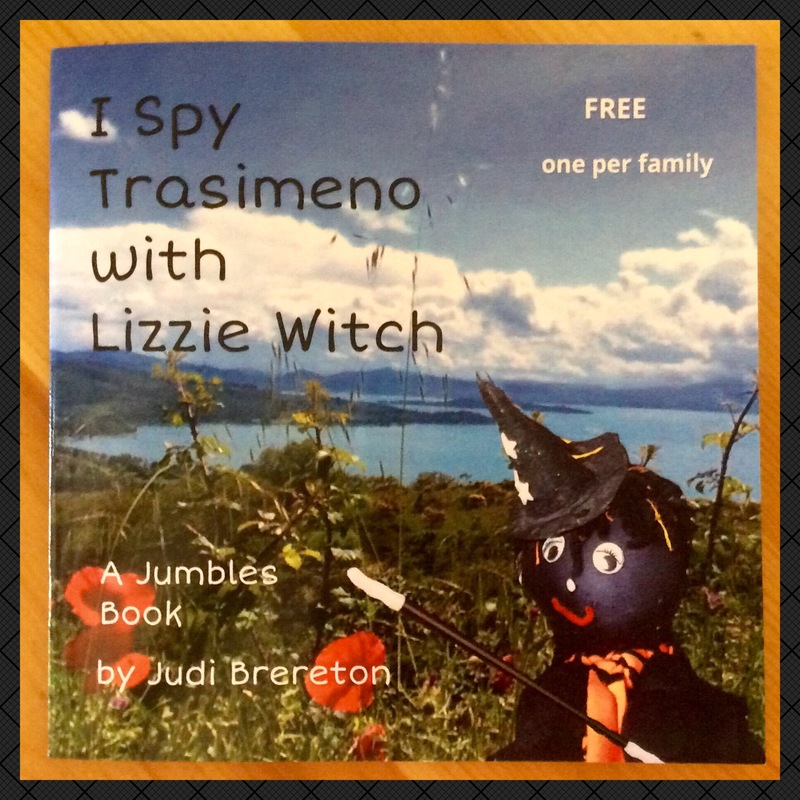 The booklet is set out like a treasure trail with Lizzie Witch challenging children to find different places and objects in four of the lakeside towns and on the two islands. I made it remembering the wonderful family holidays we spent around the lake with our (then) two small daughters and the games we played to take their minds off the heat and to make sightseeing fun. These two small girls are now Mothers themselves but still love to return here. Our family holidays were always taken during August and it was always very hot! We found it much more pleasant to play and swim in the mornings and then head off to explore the little towns, villages and the two islands during the afternoons. Many, like Castel Rigone are set high on top of hills and are so much cooler than down by the lake. But even the lower set towns with their narrow streets and tall buildings offer lots of welcome shade. It has been impossible for me to include all the really beautiful and interesting places to visit. There are just too many! Just the ones that are nearest to Lake Trasimeno. In the Playlist ‘I Spy Trasimeno with Lizzie Witch’ you will find lots of videos taken in the places around the lake and some much further afield. Some, presented by my toys, the ‘JUMBLES’ are for young children but there are many ‘General’ ones too. I made this booklet initially for our grandchildren but hope that you and your children or grandchildren will have fun using it and that it will make your stay in this magical area even more enjoyable. Website for learning resources for young children (Art, Craft, Science, Nature and Learning through Play. Website about Umbria, it’s places, traditions and festivals.